Hello dear friends and blog readers alike. This is a new painting, that I started and finished on the 18th. I find myself really enjoying the cityscape again, and am having fun with new color application, and a play on light. I think this is one of my favorite pieces, if not for its suggestive and simplistic attributes. Hey Vicki, I'm really liking the two new cityscapes! 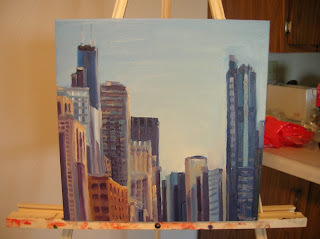 If you ever want to get together and paint this summer, let me know, I think I have an extra portable easel somewhere. Also, thanks for the nice comments on my yarn and necklaces!